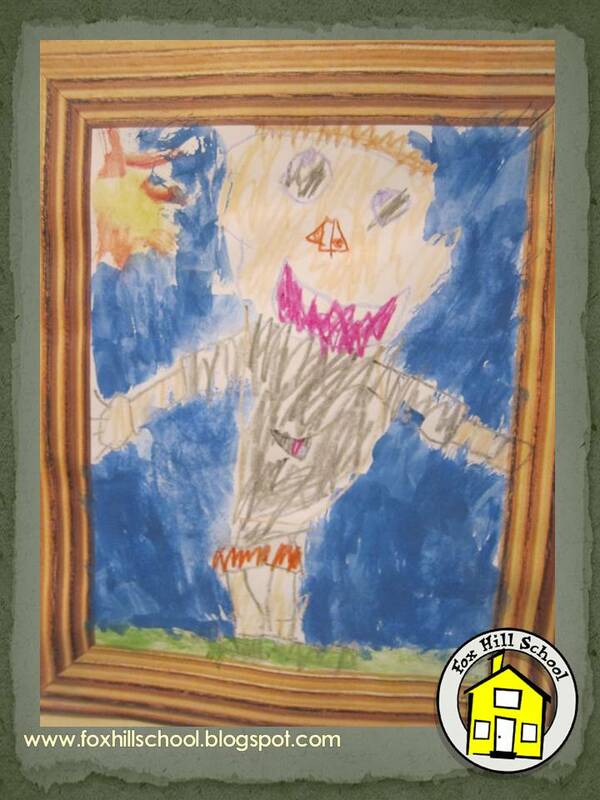 Around this time of year we do a "Monster Study" at the Kindergarten. All week we read different books about monsters. Last year I was searching for an art project to do during our monster study. 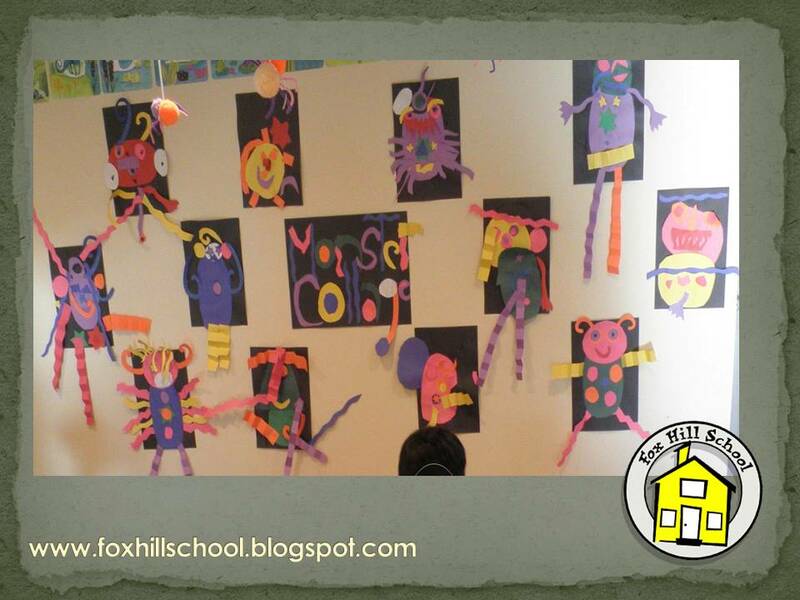 One of the parents at the Fox Hill School is an art teacher at a local elementary school and she sent me pictures of the AWESOME monster project she had done with her kids. As always, I started art class with a story, this week it was one about monsters, of course! 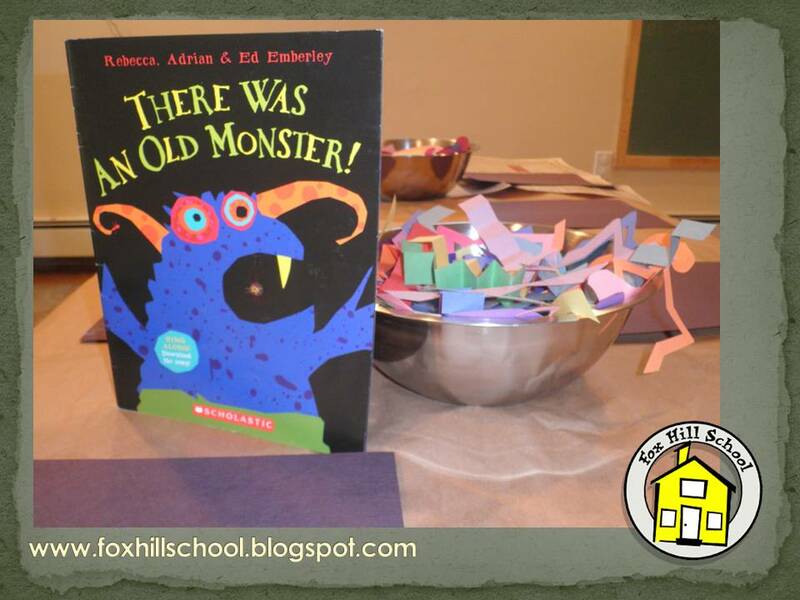 I read ThereWas an Old Monster by Rebecca Adrian and Ed Emberley. The illustrations in this story are very whimsical so it was rich with ideas for their monster creations! The project is done with construction paper and glue. The time consuming part is making all the monster pieces. If you have older kids, they may be able to cut out their own shapes, but for Kindergarten I found that they could use their imaginations more if they just focused on designing their monster and not worrying about cutting out the shapes. 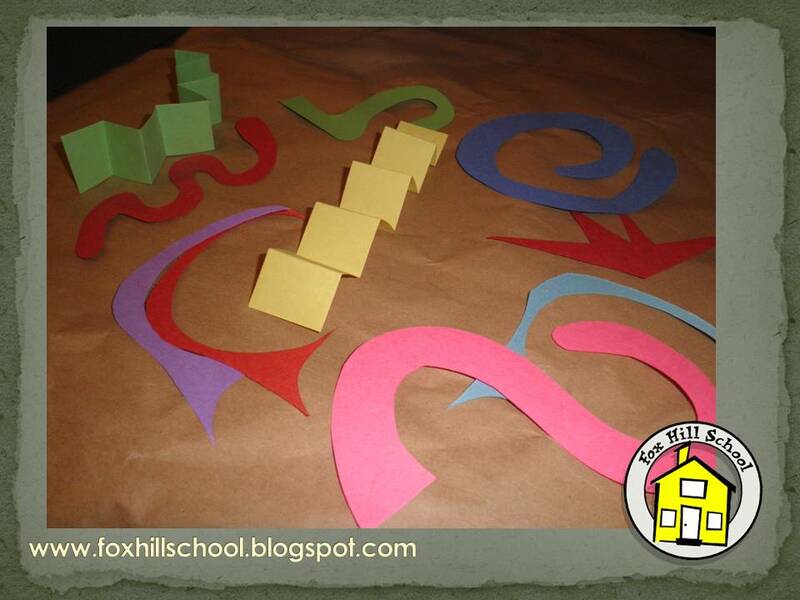 One of the parents at our Kindergarten kindly cut out all sorts of AMAZING shapes for us this year. They were not ordinary shapes - we had swirls, accordions, stars, wiggles, zigzags - you name it! I explained to the kids that there were only 2 rules for their monster creations: they had to glue some sort of body or head or both to start with and that their monster must NOT fit on the paper! All of the arms, legs, horns and hair should be glued on in such a way that they are not contained by the paper. Some of the kids thought it was "so cool!" that they didn't have to stay on the page but I could tell it was a little troubling to some of my "rule-following" kids. Once everyone glued their monster bodies on their paper I put out the bowls of shapes. The bowls only lasted a few minutes because they wanted to see all the shapes at once, so we spread them out all over the art table and they were off to the races! The conversations during the project were great! They talked about what kind of monster they were making, why theirs only had one eye, that the horns give their monster magic powers - just amazing conversations! One of the kids was done quickly, one of the kids struggled a bit with the openended-ness of the project, but the rest of them were completely absorbed in their creations and had reasons for adding all the pieces they chose. We missed school yesterday due to Hurricane Sandy but this project even tamed the "extra-long-weekend-extra-energy" that we expect after a long weekend of being cooped up inside! Such a fun project! Although we study monsters around Halloween, these wonderful monsters would be great any time of year! Take a Look in a Book? Why Not Take a Dozen Looks? Our focus book Red are the Apples by Marc Harshman and Cheryl Ryan is so much fun. I love that we read our books multiple times to our students. Often college interns will question why we look at the same book for as long as 6 weeks, "Don't they get bored with it," they sometimes ask. Our reasoning is if the book is rich enough in words and illustrations, how else are they going to appreciate or notice all the book offers?!? This picture book is filled with rhyming prose accompanied by bold and beautiful pastel-on-paper illustrations of a farm. 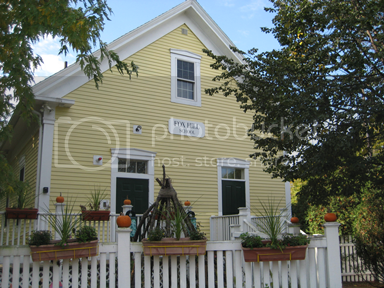 "Yellow's the corn / on stalks growing high / shading the pumpkins / and reaching the sky." This particular page is about YELLOW corn, but they were able to predict the next page is about ORANGE because it also mentioned pumpkins!!! They were so proud to find a "secret" clue from the authors to help them successfully guess what's coming next! From their moment of discovery, after reading a page we asked them to predict the next color in the story and explain why they thought it was next in line. Some pages were more difficult for them to predict than others. For instance, the beets in the story are described as crimson. Although they struggled with remembering the color crimson most of the times, they were still able to guess "It's that really really dark red!" I love it when you can visibly see learning "click" in their eyes. I think it's just as exciting to me as it is to the children!!! Pumpkin Art - 4 Ways! 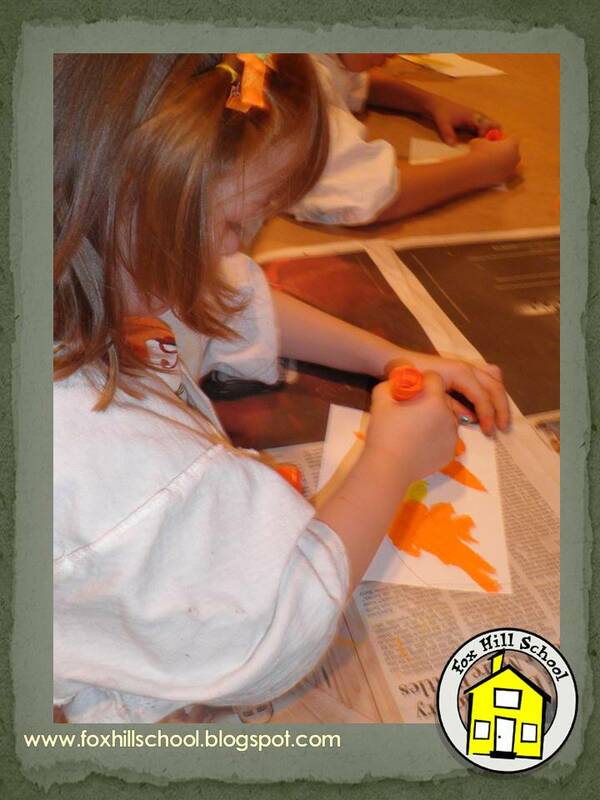 Several years ago, my kids went to an awesome art camp in our area (at The Art Center). They went on and on about the watermelon picture they were working on, but "it had lots of pieces so we can't bring it home yet." At the end of the week I finally got to see the watermelon creations and they were amazing! They used many different types of art media to create one picture. My daughter was a little older so her project had six pieces and my younger son's project had 4 pieces. I've adopted this art project for my Kindergartners but have changed the subject depending on what we are learning about (apples, hearts, etc). This year we made pumpkins! 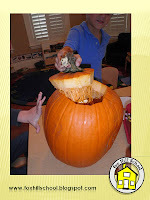 When the kids came to art class I read Pick a Perfect Pumpkin by Robin Koontz. Then I showed them that I had cut their pumpkin drawings into pieces. Then I let them know we were going to color each piece with a different kinds of art material. "OOOOOO... AAAHHHH!" They all painted the first piece of their pumpkin with liquid watercolors. 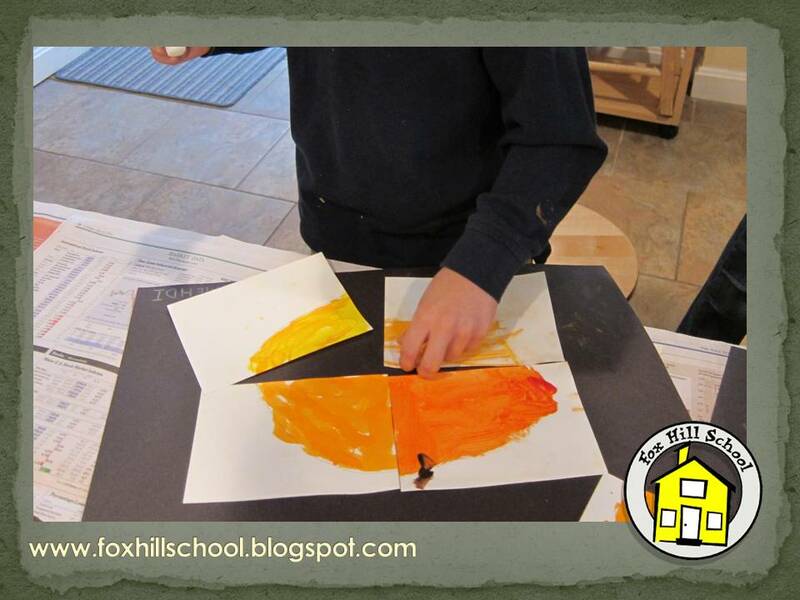 The second piece they used orange and yellow chalk. The third piece they used Smooth & Silky Art Sticks. Then for the final piece they used tempera paint. 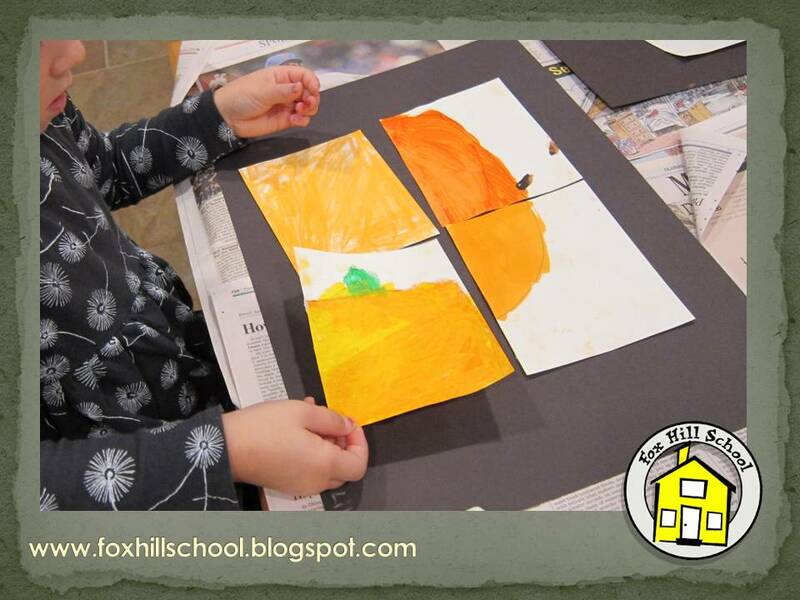 They loved using all the different types of art materials and commented on how their pumpkin pieces looked as they colored each one (this one is bright, this is smudgy, this piece looks dark). Once all the pieces were dry, they used glue sticks to glue their pieces back together onto a large piece of black construction paper. In previous years I have done that part (when my OCD was kicking in!) but this year I was feeling adventurous had them put their own pumpkins back together. Once they were dry I covered them with Modge Podge so the creations were glossy. The kids loved using all the different art materials and the result was a unique piece of art! They were able to name all the different media they used to create the pumpkins - parents were very impressed! 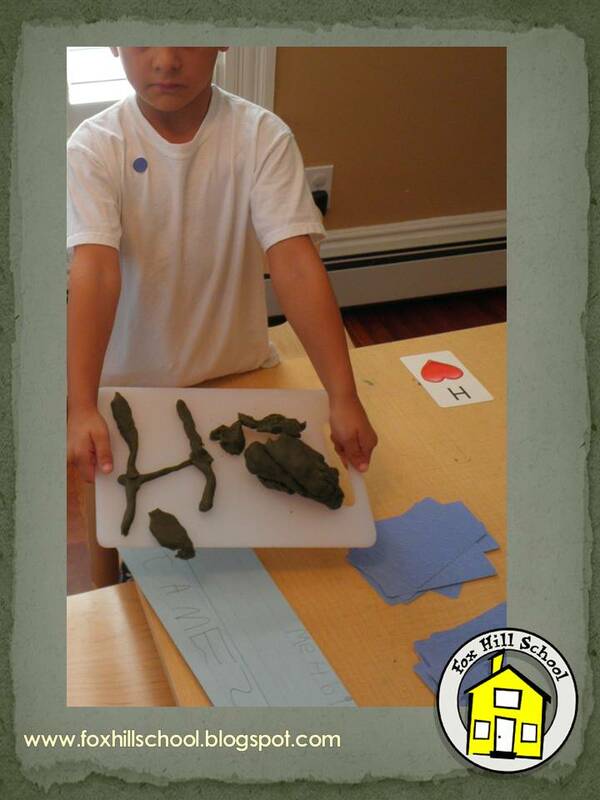 In our Afternoon Explorers Program last week the topic was science! A book that explains very well how colors mix (and a favorite at FHS) is Little Blue and Little Yellow by Leo Leonni. One of the best things with science is trying new things. Sometimes they work and some times you get an unexpected outcome. I found a color mixing experiment online involving cups of water, food coloring and paper towels. Place three cups of water next to each other. 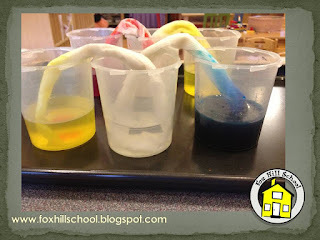 Add yellow food coloring to one end cup and the opposite blue. Leaving the middle cup clear, roll up two paper towels one end in the middle cup and other in the respective colors. Sit back and watch! After a while, the water crawls up the paper towel and is transferred into the middle cup. It is really neat to see the colors deposited into the third cup. Sometimes it's the simplicity of the experiment that makes you think... Why didn't I think of that?! If you want to take it one step further, talk about the word chemistry, make a hypothesis and graph the results for all to see! This week one of our support books was Pumpkin Circle by George Levenson. This book of amazing photographs is great for teaching children how a pumpkin grows from seed to pumpkin, and eventually rotting and reseeding to start the cycle again! Each spring we plant pole climbing beans to grow during the summer and eventually form a teepee for the children to explore. Teachers in the play yard encourage the children to come and observe how the plant is able to climb up our supports. Once the children see the thin swirls of green wrapping around our teepee frame, they sometimes follow the green path swirling up & up for a full 5 minutes! When learning about pumpkins the children are quick to notice pumpkin vines also have tendrils to help them grow! 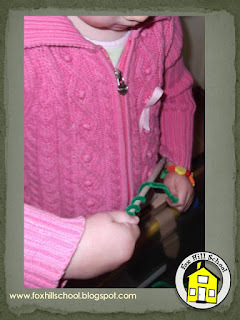 An easy fine motor activity related to tendrils is wrapping pipe cleaners around a pencil, handle of a paint brush, or handle of a kitchen spoon. We place green pipe cleaners on our sensory table with props to wrap them around. During activity time each child is invited to come and wrap their tendril around the pencil (or other). At first it feels awkward and some hand-over-hand guidance might be helpful. Once the children feel the rhythm of the wrapping they are so proud when it's completed! The final step is for them to slide the newly formed tendril off the pencil and place it in their mailbox! This week in K/PreK our focus book is Patty's Pumpkin Patch by Teri Sloat. We had a lot of fun reading this book, finding the rhyming words and learning a lot about pumpkins! Ms. Christina and I take turns planning our curriculum, and this is her week to plan, so I have had some time on my hands. She needed new play dough for some activities, so I offered to make it. 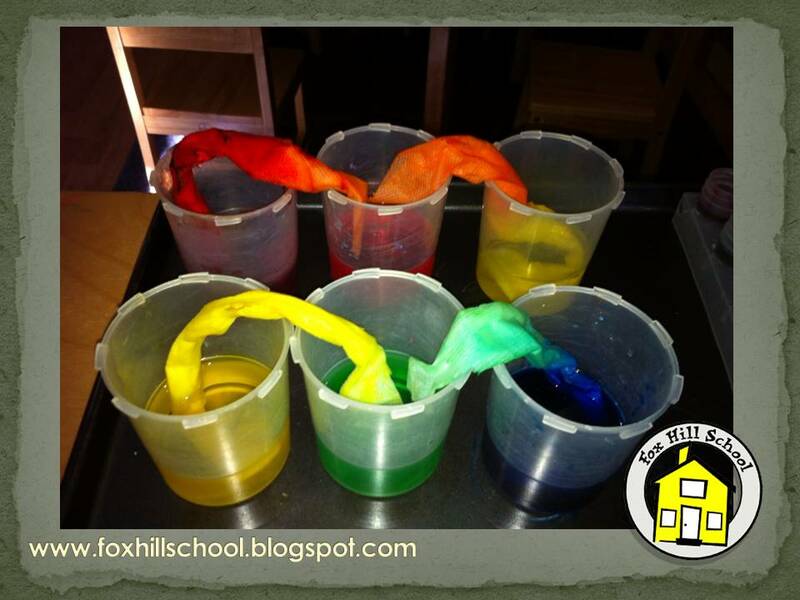 Play dough is one of my favorite things to make and use in the class. The kids love manipulating and exploring the play dough, and it is a really good material to use to work on a number of things and sneak in some fine motor activity as well. Rather than just making plain play dough, I decided to make our play dough pumpkin-y to go with our book. 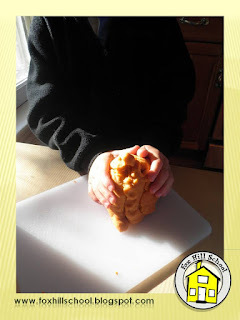 I started with our basic play dough recipe, and added orange food coloring to make it look like pumpkin. Then I added vanilla extract and pumpkin pie spice to the dough as I kneaded it. The result was play dough that looked and smelled like pumpkin pie filling. The kids have really enjoyed making letters and pumpkins out of this play dough and they've especially loved smelling it. I like adding different scents to our play dough because I think it heightens the kids' sensory experience with the material. It helps them develop their senses and use more than their eyes to solve a problem. 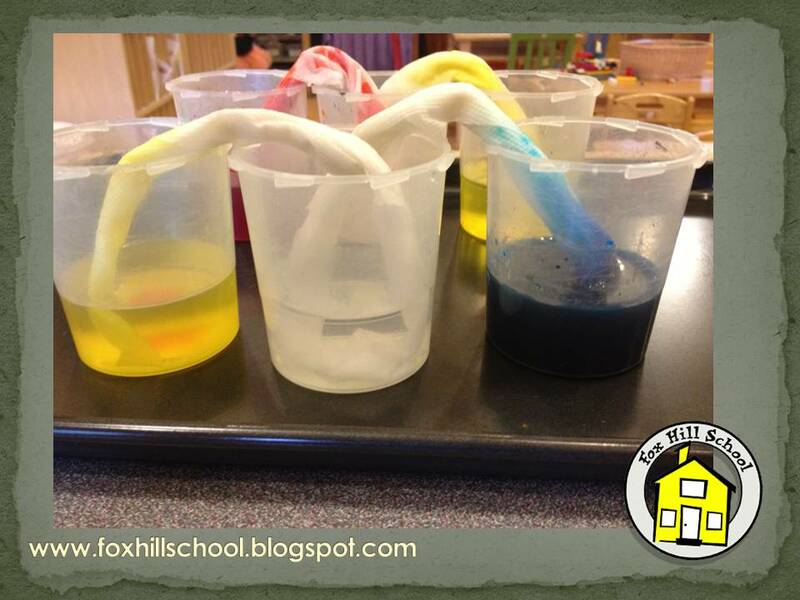 On Wednesday I added the question "what does our play dough smell like?" to our morning message. 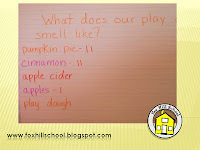 We discussed it and came up with a few different ideas - pumpkin pie, cinnamon, apple cider, apples and play dough. We then talked about what we saw when we looked at the play dough. Everyone agreed that we saw orange. I then asked, "which of the things on our list is orange?" Everyone said "pumpkin pie!" We then talked about how using more than one sense can help us solve problems. 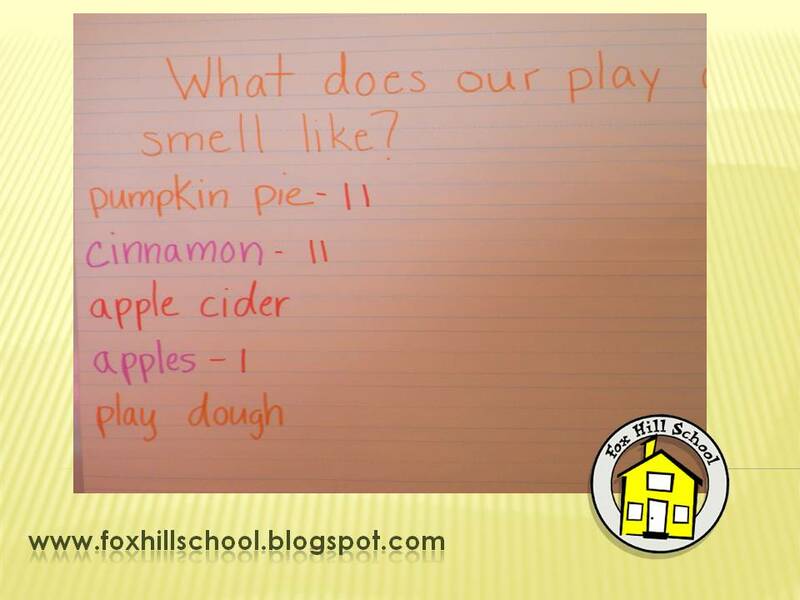 When only smelling the play dough we might think it smelled like apples or apple cider, but when we combine seeing the orange color with the fruity/cinnamony smell, we knew in an instant that it was supposed to be pumpkin pie play dough! Stir until blended, remove from heat, add pumpkin pie spice (I used 3/4 of a 1.1 oz container) and knead until cool. I find that putting the play dough in a gallon sized ziploc bad while it is still warm, keeps it soft and moist. *This time I added vanilla extract, but we've also added coconut extract when doing our Chicka Chicka Boom Boom unit, or peppermint extract during the holidays. What other scents could you add? Nothing goes together better than the fall and pumpkins! 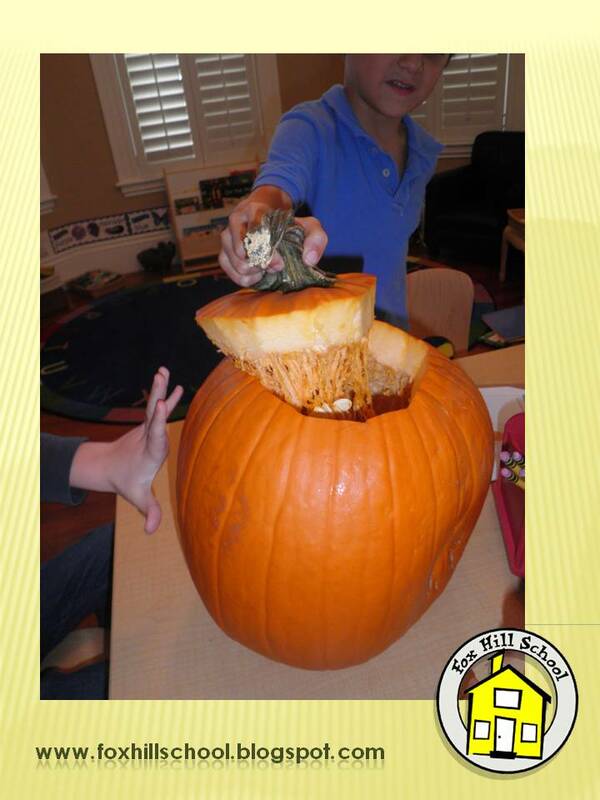 This week, we were immersed in everything pumpkin! 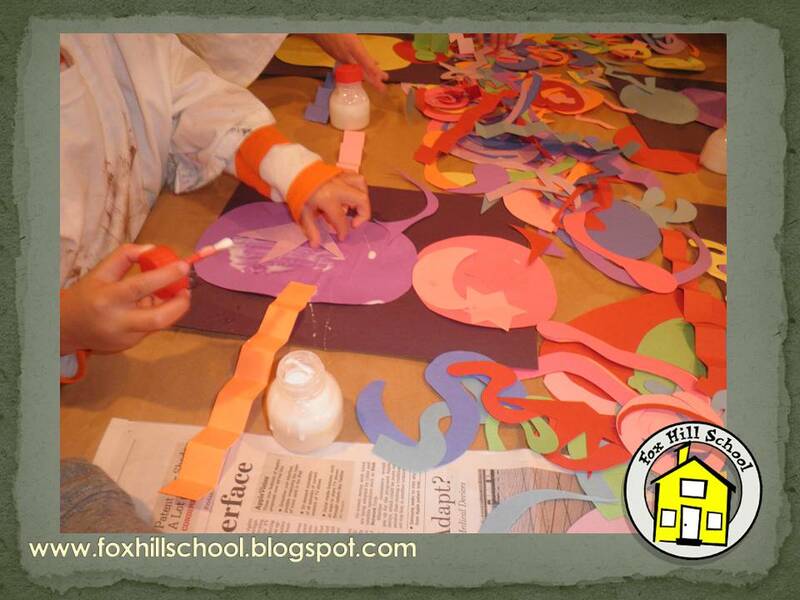 From pumpkin play dough to pumpkin science, our kindergartners were surrounded by the orange fruit that grows on a vine! In Shared Reading, we used the book, Patty's Pumpkin Patch by Teri Sloat. 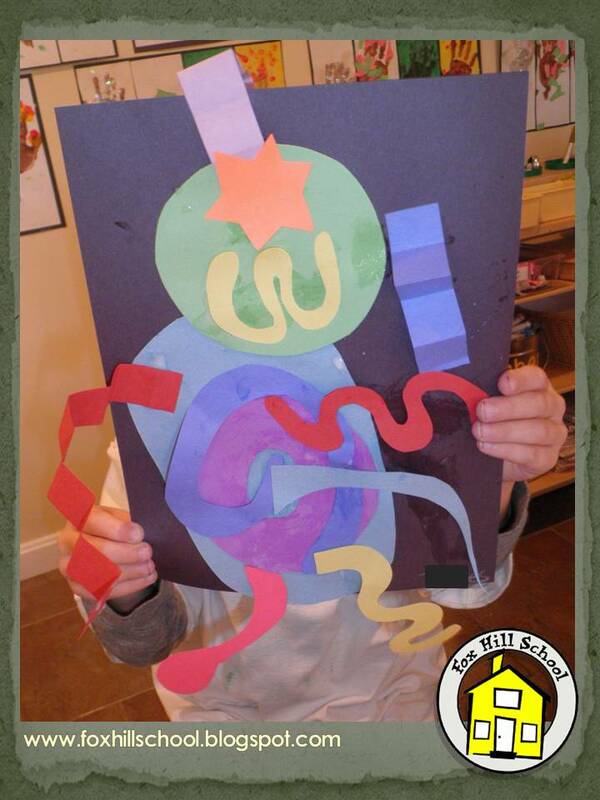 In this story, the life cycle of a pumpkin is described, using rhyming words and colorful pictures! If you take a closer look at the illustrations, there are hidden insects and animals. The children loved trying to find them and even discovered new animal names! For our math activities, we focused on patterns. We made patterns with apples, pumpkins, and leaves. We also sat on the rug and made patterns using our hands and feet. Every child was able to create and verbalize their own pattern and everyone repeated it! My favorite activity that we did was at the end of the week. 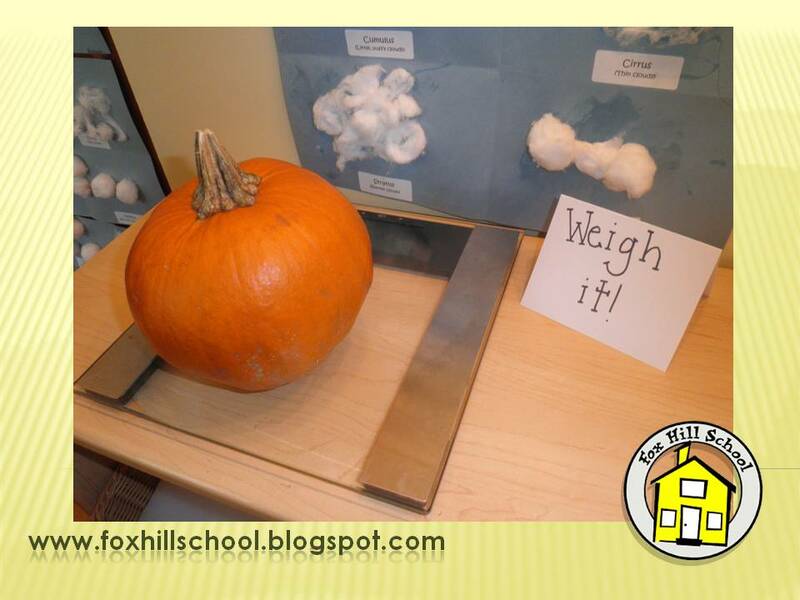 We used our scientific observational skills and studied a pumpkin that was brought in from home. All around the room, we set up stations (Describe it!, Draw it!, Measure it!) and the children rotated through, armed with a clipboard and their pumpkins. 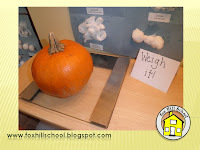 We weighed our pumpkins, measured them with Unifix cubes, used adjectives to describe our pumpkin, and predicted if it would sink or float. We were able test our hypothesis and draw our findings! We also asked them to imagine what the inside of a pumpkin looks like and then showed them the real thing! 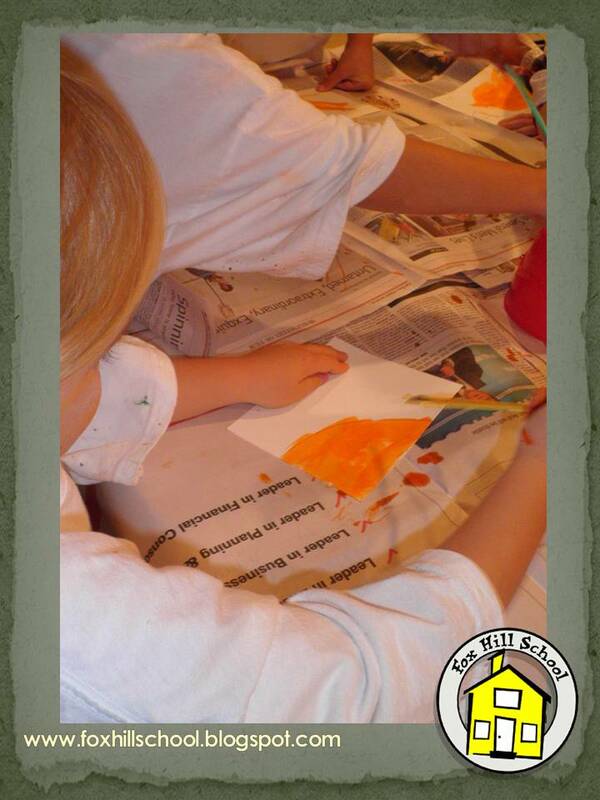 Lastly, the children were able to paint their pumpkin to use as a decoration for Halloween!! In our focus book Red are the Apples, we are learning so much about colors seen on a farm or in a garden! 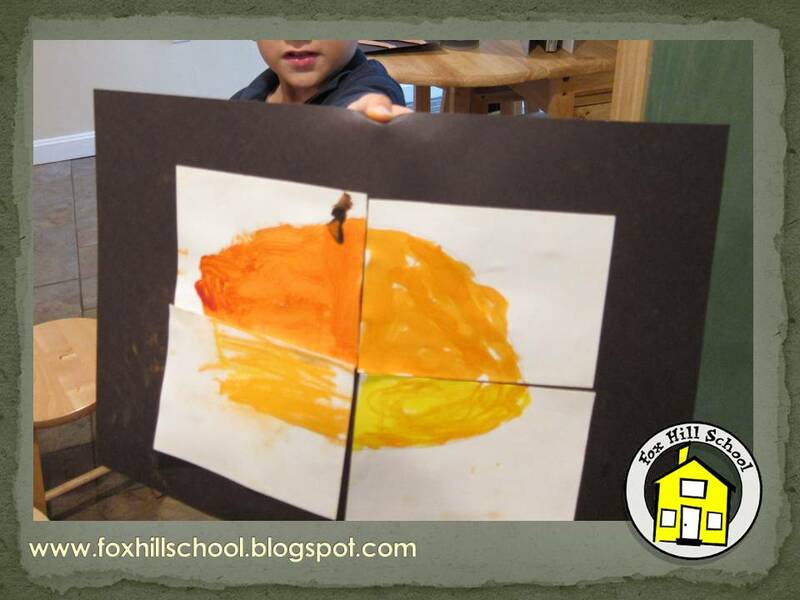 One fun activity is to create stamped prints of the cross-section of an apple. Personally, I'm a not much of a perfectionist and, perhaps, little bit sloppy to boot! I don't really mind the mess a project like this potentially can whip up. Some of my coworkers AND students.....well, they are NOT fans of the big ol' messy-messiness! To help control the the potential chaos of apple halves sliding in paint trays, out of little hands and across the floor or on a neighbor's lap we came up with a simple solution. The apples were cut in half, and then we simply stuck a popsicle stick in the top of the apple. Careful!! Don't push it through so far it sticks out the other side! 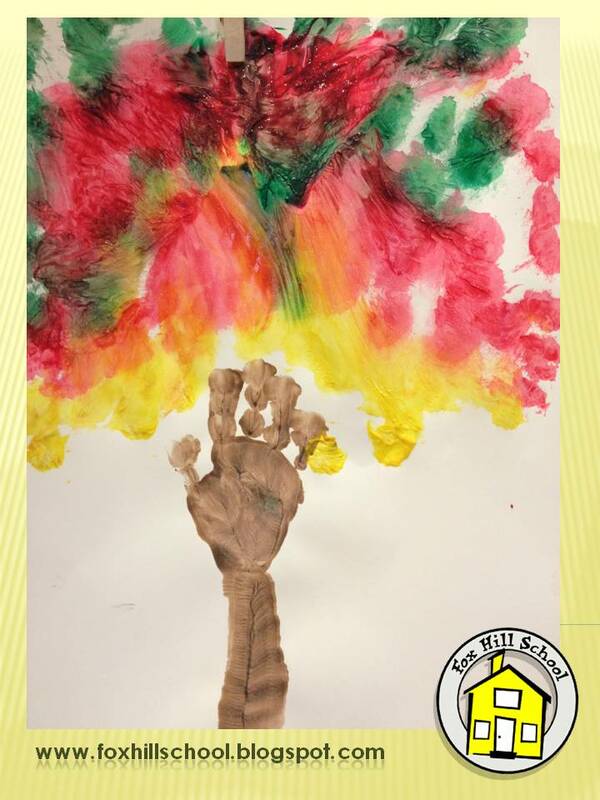 This provides an easy-to-grasp handle for the small hands of our students! 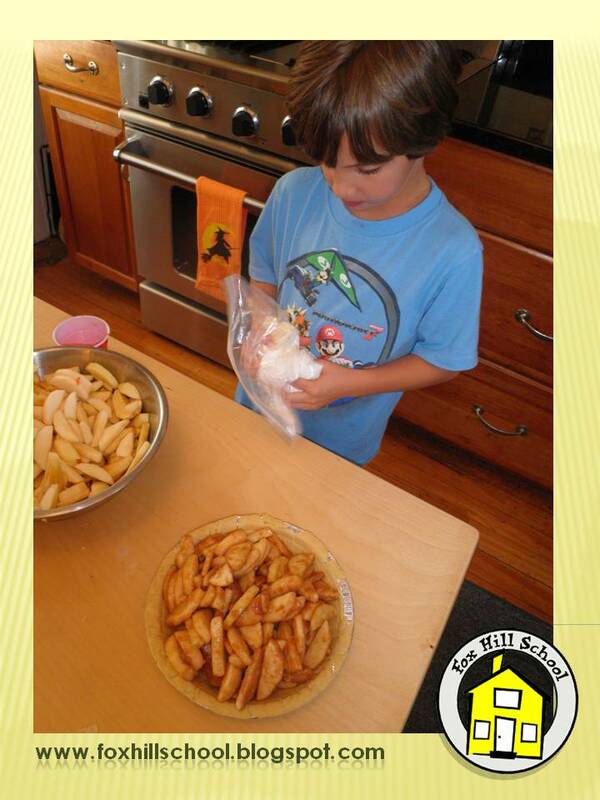 Be certain to have several extra apple slices ready to use. Sometimes after 4 or five children have stamped with an apple the sticks become loose. If you see this happening, just toss the used apple and stick the popsicle stick into the apple half you have ready & waiting! In art class at the Kindergarten we read the book The Seasons of Arnold's Apple Tree by Gail Gibbons as a support book to the shared reading book for the week, Ten Red Apples by Pat Hutchins. The story explains all the transformations Arnold's apple tree goes through as each season passes. We saw this great art project online last year that tied right into this book - we showed all the seasons of OUR apple trees! I divided large pieces of white paper into 4 equal pieces. 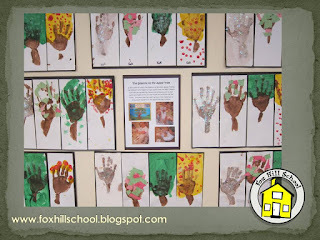 The kids painted their hands and forearms brown and made a print of it on each of the four pieces of paper to make the "trunks" of their trees. 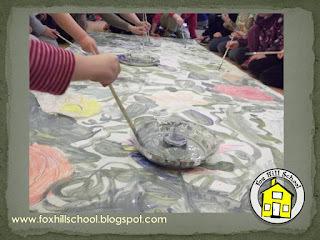 The next day when the trunks were dry we used all sorts of different art materials to show what the apple tree looks like during each season.For winter we painted with white tempera paint and then added iridescent glitter. To portray the spring, the kids ripped pieces of green and pink construction paper (great fine motor activity!) and glued the pieces to the trunk. Summer was painted with green paint and light green apples were added by dipping Q-tips into the paint to make dots. 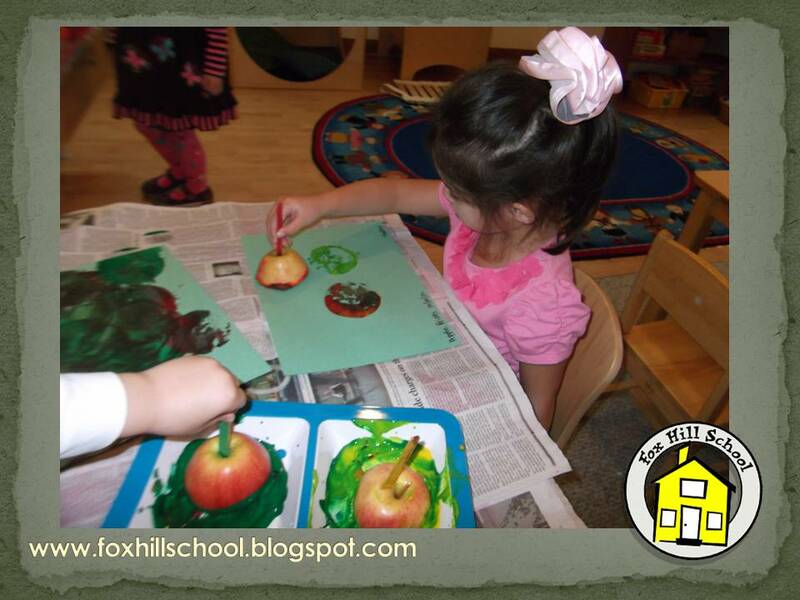 In the fall, the story showed that the apple tree's leaves turn yellow and have red apples on them so we did the same! We did all the seasons in one day. Next time I would break it up and do a couple seasons at a time. 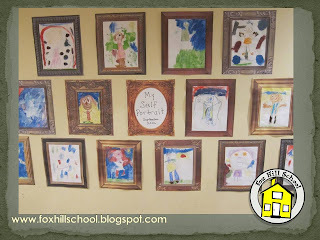 To display their fabulous creations, I mounted each child's work on a large piece of black construction paper. In the middle of the wall display I explained how we did the project and showed photos of the children working. 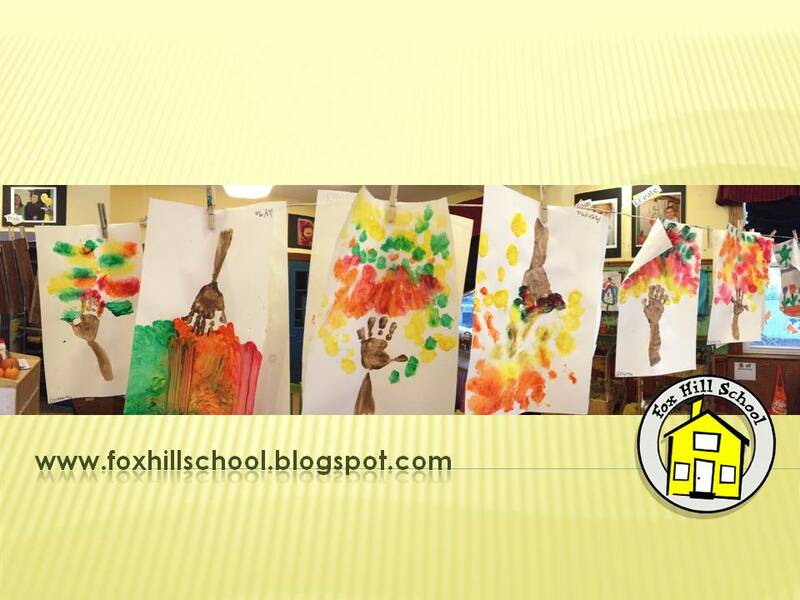 This was on display for our curriculum night so parents could see their children at work in art class! The leaves are falling and changing colors outside, so for this week in our Afternoon Explorers Program, we focused on making fall trees. 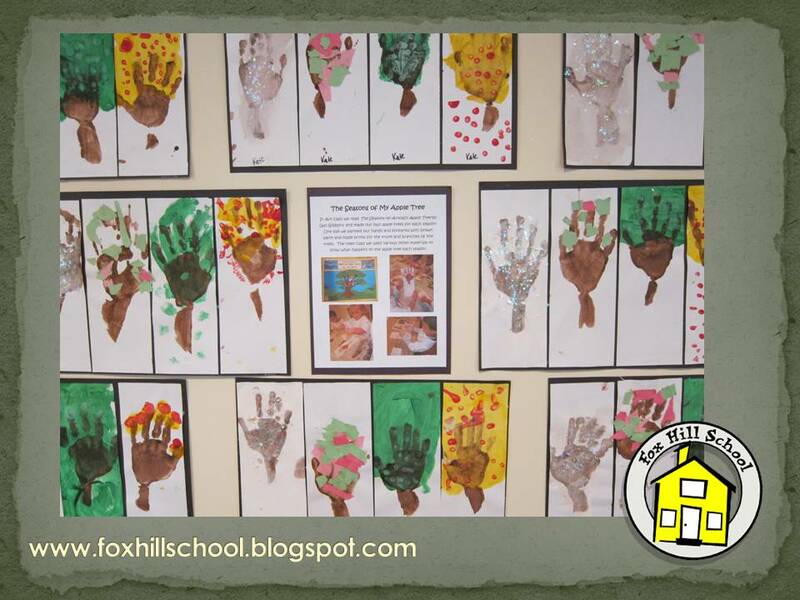 We started by painting the children’s hands and forearms (up to their elbows) brown. We stamped their arm prints on a large sheet of white paper, this is the trunk and branches of the tree. When dried, we took a medium sized paintbrush and used red, yellow, orange, and green paint to make little paint dots on top of the branches of the tree. Then we covered the paint dots with saran wrap and squashed the paint all over the tops of the trees! It was so much fun to see all the different colors swirl around together and make beautiful FALL LEAVES! Need Leaves? Fake Fall Foliage on the Cheap! We needed fall leaves for our sensory table and it's been raining here for weeks so we only have lots of wet leaves at our disposal. I could only find a couple of small sandwich bags of artificial leaves left over from last year. Although fake leaves aren't terribly expensive, I wanted a LOT of them to fill our table to make the experience more exciting for the children. 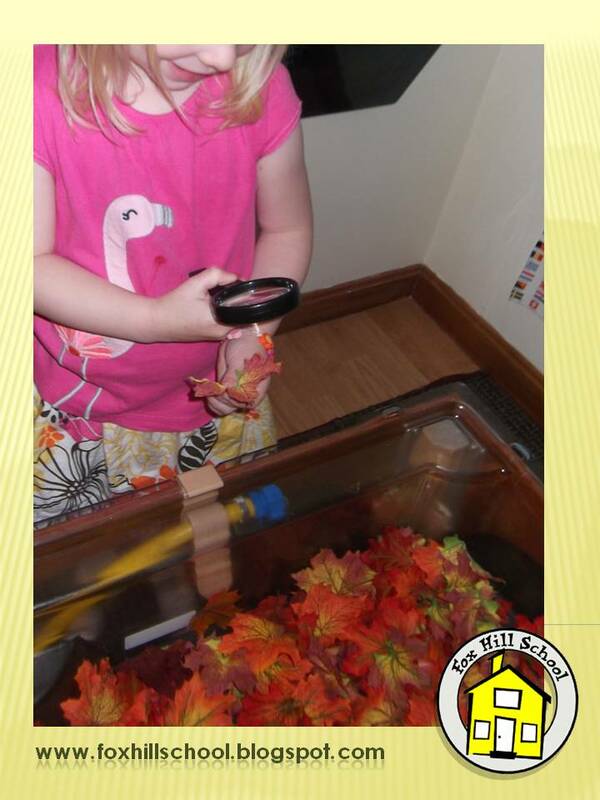 It is also an easy way to allow children with allergies or sensitivities a chance to explore fall foliage. If you're in need of a large amount of artificial leaves here's an inexpensive solution: Purchase a garland of leaves from a craft store like AC Moore or Michael's. These stores in particular always have a 40% or 50% off one regular priced item. I would check to make sure the stems attaching the leaves do NOT have wire inside the plastic....just plastic stems all the way through. The metal ones will be harder on your hands when snipping the stems and it's likely a child will end up getting poked, or being the poker of his/her neighbor at the table! (Come on...you know that's bound to happen). Break out your scissors and simply snip the leaves off the garland! 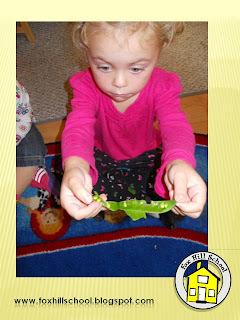 Fill your sensory table with leaves and watch the children have a blast tossing them in the air and back into the table. My friend Susan is an elementary school teacher who taught in a K-1 class for many years. On several occasions she voiced her frustration in the lack of math learning opportunities in many private preschool programs. We talked about how children are innately drawn to playing in mathematical ways...counting, sorting and more. Susan said she was particularly disappointed that children often entered her classroom without the knowledge or ability to extend or create an AB pattern! 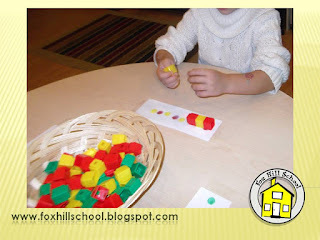 I was surprised this was her experience, and decided to make learning about patterns so much fun the children will be hooked on patterns (and hopefully math) all of their school years. I've found the easiest way to teach children patterns is by singing them. 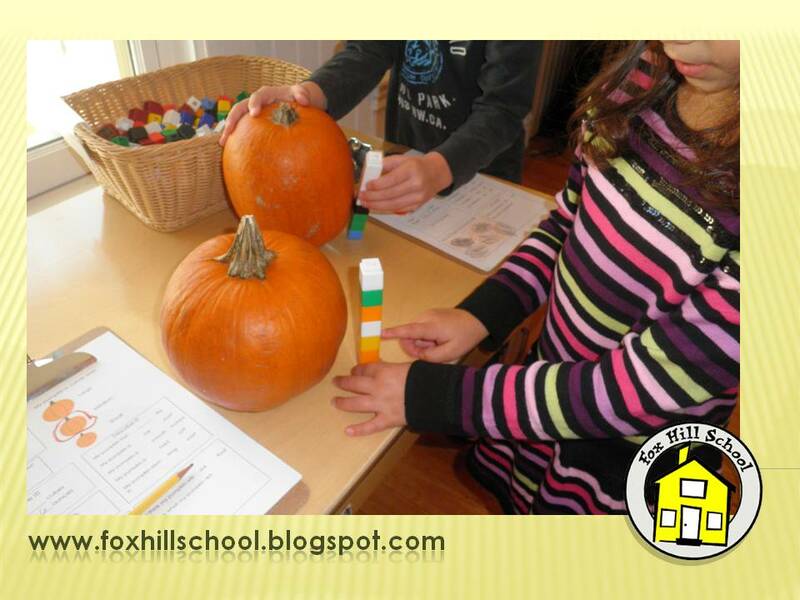 For instance, this week we used unifix cubes to create patterns using fall colors. We challenged our children to extend AB, AABB, ABC, and finally AABBCC combinations. At group we explained how a pattern is something that repeats. Using some patterns made with Unifix cubes, we chanted each color: red-yellow(pause) red-yellow(pause) red-yellow. "What should be next?" We did this for all the pattern combinations. Later, when we broke out in our activities a teacher kept a watchful eye on the table with the patterns. Samples of patterns were taped to the table. When we saw a child struggling copying and/or extending the pattern where they sat, the teacher would help them try to figure it out by chanting/singing the pattern to them. Typically after a few times of demonstrating this skill to the child, they begin to do it on their own. One day a just-4 year old girl in our room was singing the pattern she created aloud, "orange/green, orange/green, orange/yellow....wait a minute! That's not the one!" Simply by singing the pattern, she was able to recognize she made an error, and quickly correct it. She was actually so excited she discovered the error on her own, she paraded around the room to let some of her best friends share in her discovery! The beginning of a new school year is an exciting experience for both the children and teachers. Exploring and setting boundaries in this new environment is crucial, but how do you turn the rule making process into an exciting group effort? The reality is, nothing is new about it! Every year the rules are basically the same. What makes an impact on the students is that it feels new and they had input. 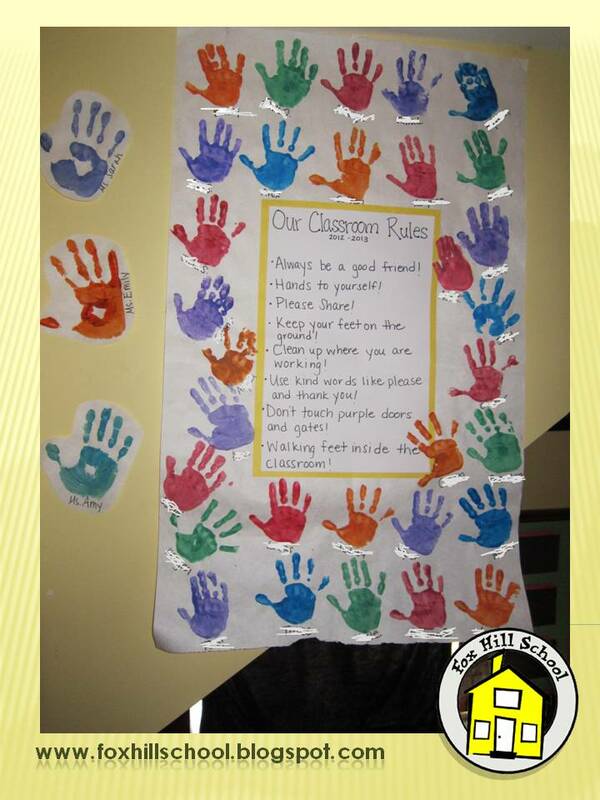 During group time, ask the children to think of rules that should be added to the list. There will be an array of replies. Be sure to write them ALL down! Remind the children that rules don't always need to start with words like NO and DON'T. Rules sound better with a positive spin! After you gather your rule suggestions, narrow them down and choose a way to display them. We chose to write it on a large white paper and mount it on colored construction paper. This is where the real fun comes in! 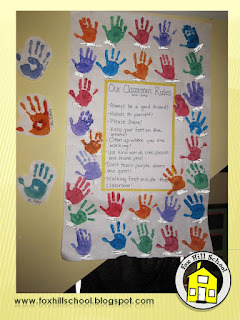 Because it is on display all year round we thought a great way to put our stamp of approval would be with a hand print. 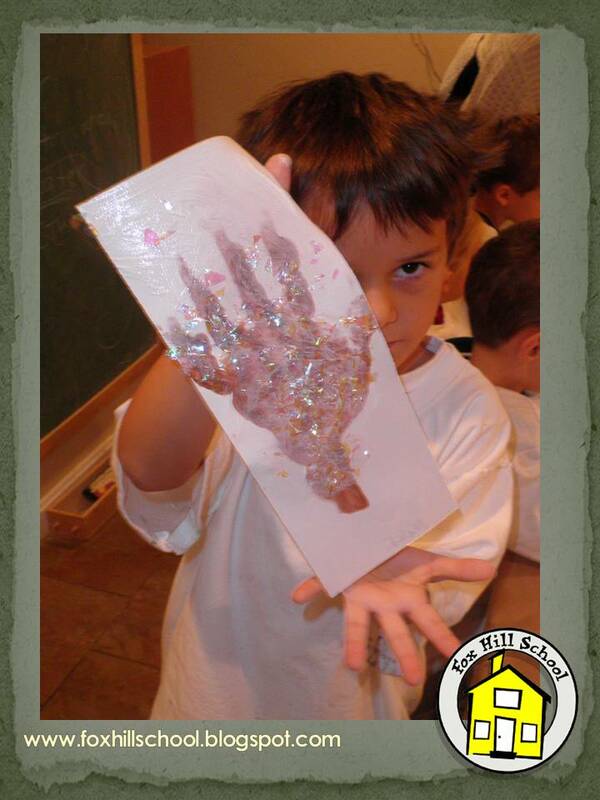 Using hand prints as the children's signature fits this project because many children in a mixed age group have yet to learn how to write their first names. 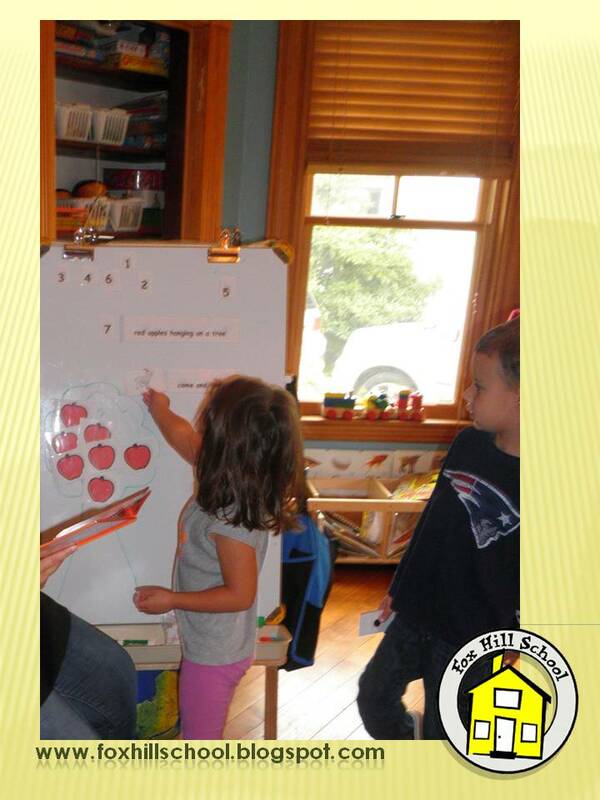 It is important that the children feel unified, not separated by who can and cannot write their names yet. 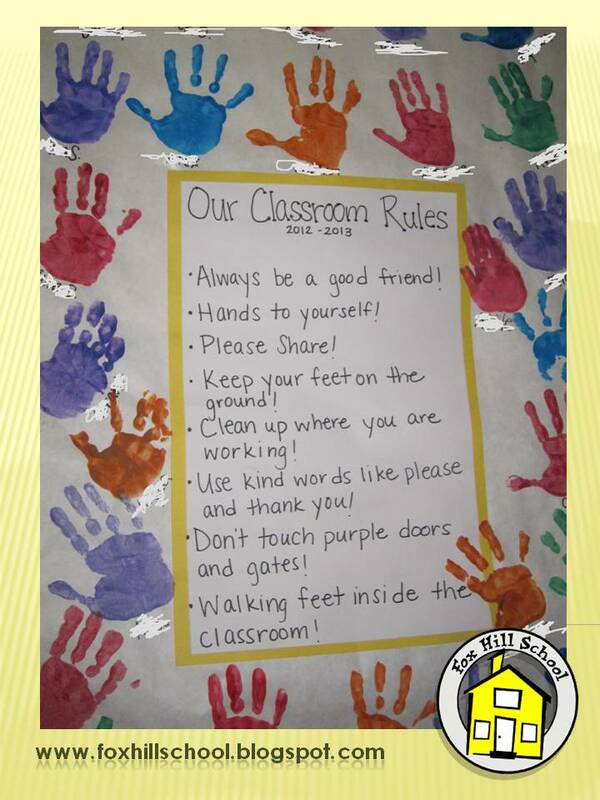 Then, if need be throughout the year, we can refer them to the rules on the wall that they "signed" if they need help remembering one of them! 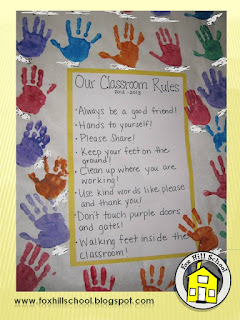 Don't forget the teachers hands as well! Another way to score free enrichment opportunities for your class is to approach your personal friends! If you don't feel comfortable yet asking parents to come in and visit, your friends should be fairly easy to approach and, hopefully, accommodating. They are your friends after all! Trent Austin is a jazz musician living in our area. He spent 60 minutes in our class talking, playing and laughing with the children. He transformed his trumpet into animals suggested by the students. The sound of horses, cows, elephants, and even rhinos filled our room. Then Trent wowed them with Flight of the Bumblebee!!! From familiar wedding marches to technically challenging Paganini pieces, Trent's playing was met with applause and even shouts of "Encore" from one 5 year old boy! 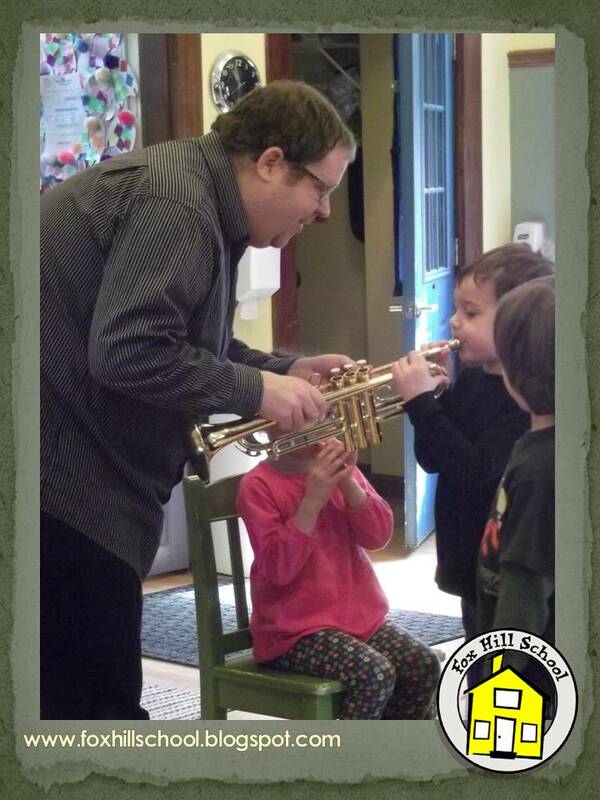 Everyone had an opportunity practicing puckering up and blowing through one of the Austin Custom Brass Mouthpieces. Once successful they inserted the mouthpiece into one of the three trumpets Trent brought with him! Trent doesn't belong to one of the current FHS families. He is my neighbor and agreed to come and play when he was home in between cross-country gigs! (He felt he owed me for walking his dogs and collecting mail while he & his wife were out of town). Think about your friends and their talents, and ask them to spend 1 hour a year in your classroom. Call in a few favors. What's the worse that'll happen when you ask? They might say no, thanks.....but my experience is they nearly always say YES! In addition to our focus book, Ten Red Apples, we read many other books about apples last week. We call these books our support books, since they support our focus book by reinforcing information or providing new information to the students. One of our support books last week was called Welcome Fall - Apples by Marilyn Easton. This non-fiction book has beautiful, colorful photographs of apples and apple trees, and provides the reader with some interesting facts about apples. One thing it explains is the different parts of an apple. This seems like pretty basic information, but a lot of kids didn't know the names for all the different parts. We learned the words, core, skin, stem, leaf, flesh and seeds during shared reading and took turns labeling the different parts of an apple. We then discussed which parts of an apple it is ok to eat, and which parts we shouldn't eat. This lead to another cooking project! Applesauce! Although I personally like my applesauce chunky, I've found that kids (especially my own) prefer their applesauce smooth, so I've started using the food mill to achieve smooth sauce - and to provide the kids the opportunity to use their arm muscles! To make the apple sauce - all I do is quarter a bag of apples (adding skin, seeds, stems and all) and cook them down with a little water and a lot of cinnamon for a few hours. We are lucky enough to have a full kitchen in our classroom - so the apples simmer while the kids do their morning work, filling the classroom with a delicious smell! Once the apples were soft enough, we ran them through the food mill - each child had a chance to turn the mill and were amazed by the smooth applesauce that came out. The food mill separates out the parts of the apple we should not eat (seeds and stems), and turns the flesh into smooth, delicious apple sauce. We ate it for snack that day. I love fall! The cooler days, the bright blue sky, apples, pumpkins, and colorful leaves - all of it. Fall, especially in New England is a great time to be a teacher. There is so much for kids to learn and experience all around them. We tend to have a new focus book each week in K/PK (instead of each month) so the challenge for me in the fall is fitting everything I want to do into one week. This past week we have been working with the book Ten Red Apples by Pat Hutchins. We read this during shared reading and the kids love making the animal noises and saying the refrain "save some for me!" This story lends itself well into being acted out - and it works perfectly for my class of 10. I drew a big tree on my magnetic board and put 10 pictures of apples in the tree. I used clip art to make pictures of each of the animals in the story, as well as a picture of a farmer. I also made sentence strips with the words from the book on them and added those to the magnetic board. 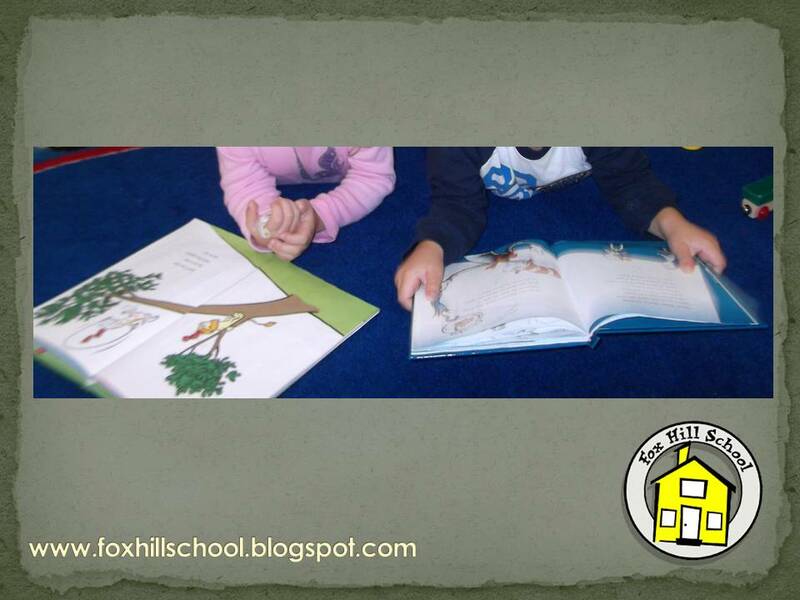 As I read the story, each child came up to the board when their animal character was mentioned. 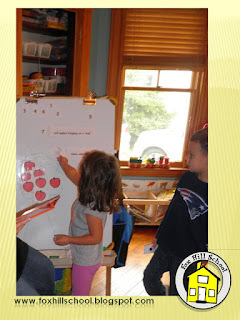 They picked an apple from the tree, changed the number on the board to reflect the correct number of apples on the tree, and made their animal's noise. The child who was the farmer then got to say "save some for me!!" Later in the week, we took the class apple picking at a local apple farm. We got a chance to see many of the animals from the book in action, in addition to picking apples. 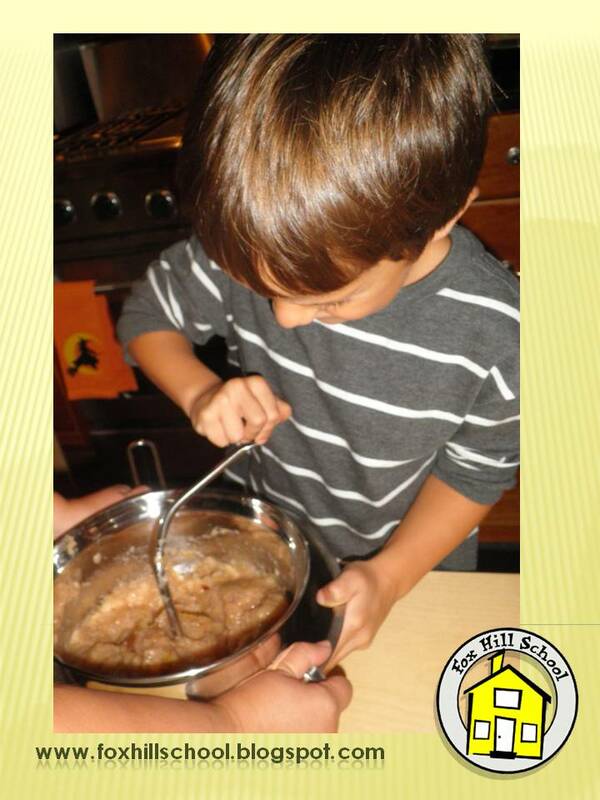 When we returned to school, each child had the chance make an apple pie - just like the farmer's wife did in our book. It seems overwhelming, but thanks to a kind teacher at my kids' school, who did this activity with kindergartners and their parents, I learned an easy way to get 10 kids to make their own apple pie, without going crazy. First we took premade pie crusts (I know that's cheating, but anyone who knows me will testify that my OCD would go into overdrive if I had to make my own pie crusts!). Then we filled gallon sized ziploc bags with cinnamon and sugar. We filled another ziploc bag with butter, sugar, and flour. 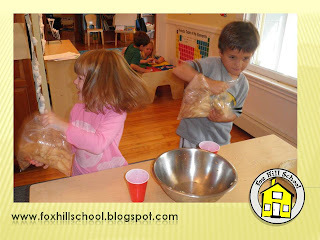 The kids then filled the first ziploc bag with apples and shook the bag to coat the apples with cinnamon and sugar. They then dumped the sugared apples into the crust, and set to work squishing the butter, sugar and flour together. 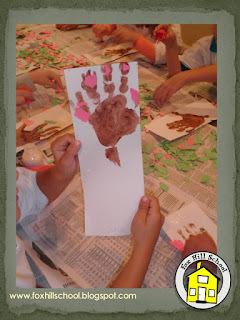 This is a great fine motor activity and we stress that they need to use their finger muscles to make their pie! The butter/sugar/flour mixture becomes a crumb topping that we dumped over the apples. We covered the each pie with foil and sent them home to bake for 50 minutes at 350 degrees. This way each child gets the chance to share the pie they made with their family. It gives them a sense of pride that they made their own pie AND they really are delicious! We're moving into our next focus book called Red Are The Apples by Marc Harshman. We live in New England so fall = apples. Do you feel like you've already done every apple activity you can think of? Well, what more can you do with an apple? Math: Do you know that even to this day horses are measured by "hands?" Horses are measured from the ground up to the withers (what laypeople might call the front shoulder) by how many "hands" tall they are. 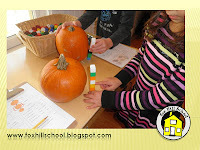 We have great fun introducing math concepts by measuring with apples! During our group time or our activity time 2 children lay on their backs, and pairs of children will use apples to measure how tall they are "in apples." Later we create a chart graphing how many apples tall each child in the room is! The children love referring to the graph for weeks! Art: An easy way to introduce the term still life is with an apple. An apple is inanimate and therefore qualifies as a subject for a still life illustration. This year we had the children look at a MacIntosh apple. It was emphasized NOT to touch or move the apple and draw what you see from where you are sitting while working. 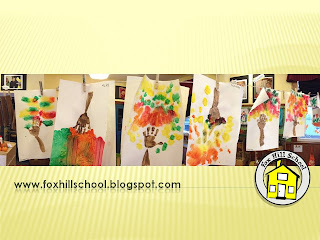 We gave them green, red, yellow, brown and white oil pastels to use on black construction paper for the still lives. The children were curiously amazed when they realized how many colors they could see from their perspective: some saw more green then red, others saw more red than green, and others noticed tiny brown spots! We hung the collection of still lives in the classroom. Days later I was pleasantly surprised to overhear one child explaining to another why the colors varied dramatically from still life to still life! What will YOU plan do with an apple?!? Free Enrichment - Part One - How? Get to Know Your Families! Why bother taking the time to design, distribute, collect and finally read family interest questionnaires? It's a great way to get to know your families!!! We have discovered so many interesting hobbies, vocations, and interests of the parents/guardians at our program through these questionnaires. Nine out of ten times, if we approach them to spend an hour or a morning in the class sharing their talents with the children they do! EMTs parked an ambulance in our driveway and the children were able to climb aboard. Firefighters drove "the truck" to our school and the children were able to explore all the nooks and crannies of the apparatus. Musicians have performed mini concerts. A comedic actor came to share silly stories. A police officer brought his cruiser and let the children see much of his protective gear and communication devices. We had a lesson in sign language and were able to "sign" the rainbow song while we sang it! An artist visited and assisted our children in creating a beautiful Monet-inspired mural. A family member raised in India came and cooked a feast for her daughter's class. These are all enrichment opportunities that grew out of things we learned by reading the questionnaires. For cash-strapped programs, the best part about approaching family members to share their interest/vocation with the children is that it is almost always FREE! 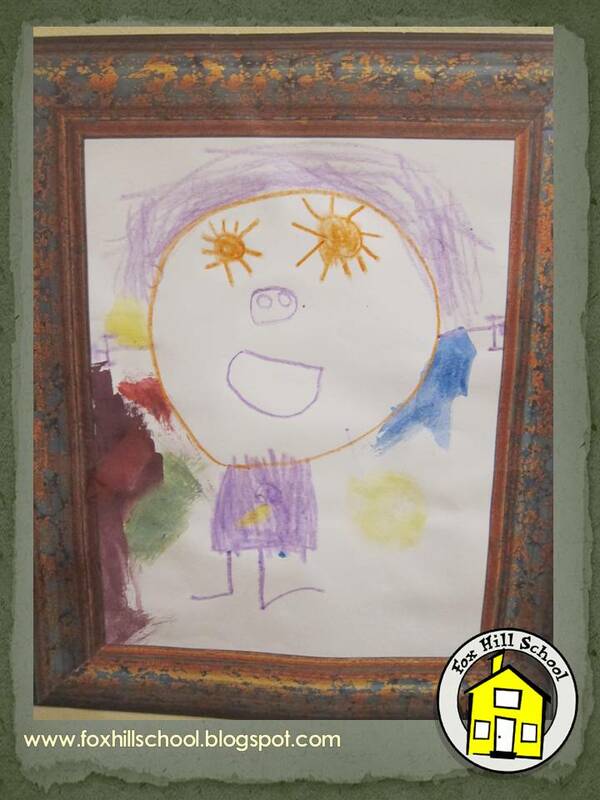 At the beginning of each school year we like to have our Kindergartners draw a self portrait and we save these in their portfolios. 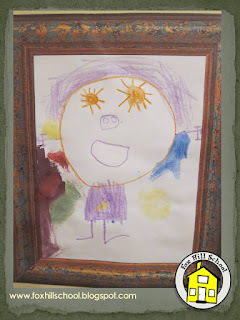 We have them repeat the self portrait project again at the end of the year and then we can compare the two drawings to show the child's progress. 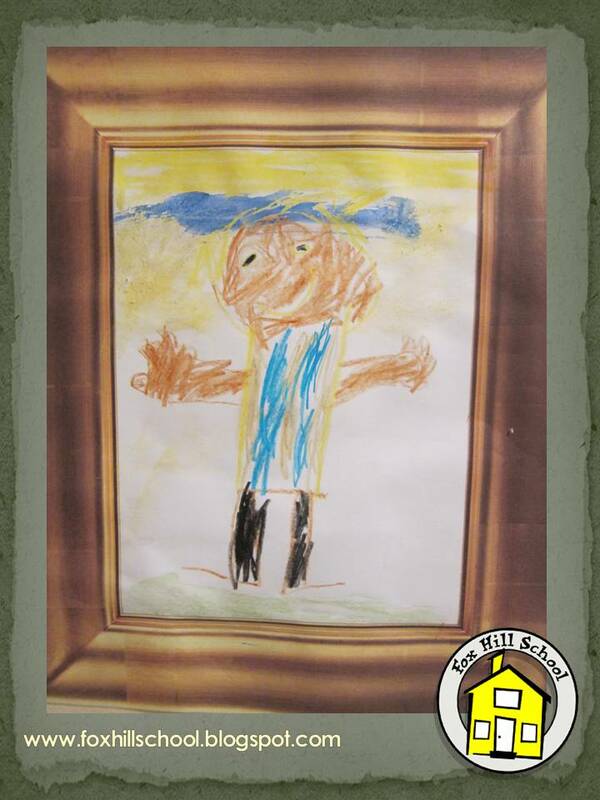 Over the years we have had the children draw these portraits with crayons, colored pencils, tempera paint, you name it. 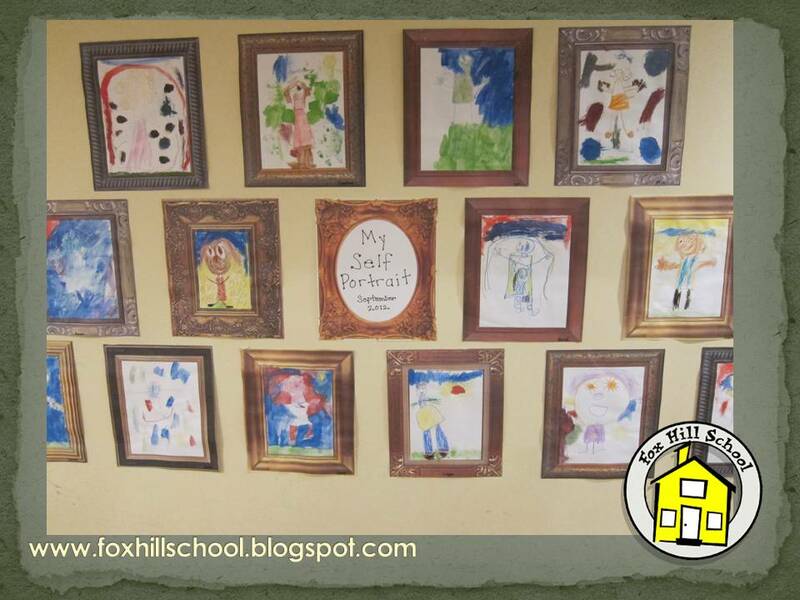 This year, before we place the portraits in the children's portfolios for safe keeping, we wanted to display them during our upcoming curriculum night for the parents so we wanted them to be extra special. A few years ago, Ms. Michele told me about this great paper she got for her kids for Christmas. It's a large pad of paper that has picture frames printed on each page. I purchased the paper from Amazon for our self portrait projects this year. 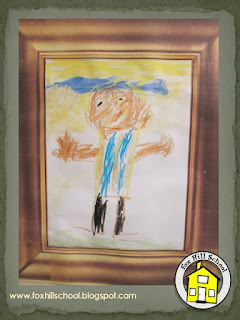 First I had the children draw a picture of themselves with crayon. Then I gave them watercolors to fill in their background. Some kids filled in all the white space, some kids actually made a scene as their background with the watercolors. Regardless of what they chose, all of the artwork looks extra special on this fancy frame paper. The kids really concentrated on doing their best work on this project as well, I think, because it looked important even while they were working on it! When displayed, it really looks like an art gallery! Chicka Chicka Boom Boom, from the Kindergarten! Here at the Kindergarten, there were so many ways to incorporate our love for Chicka Chicka Boom Boom into our curriculum! We used the amazing coconut play dough during free play, as well as during our Literacy work station, where we chose a letter card and made the letter out of the play dough! 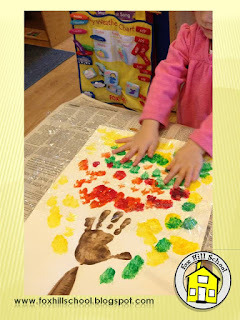 This is a great fine motor activity and helps to get our hands and fingers ready for writing. We really focused on our letters this week, sorting upper and lower case letters, playing letter bingo and we even practiced writing all of our letters! As a support book, we read Chicka, Chicka, 1, 2, 3. We flipped over paper coconuts and had to stack that many unifix cubes! Some friends made single stacks, while others made one long stack! We also played a count and color game, using dice and a paper full of coconut trees! The students rolled the die then counted the number of dots. Using that number, they were to color in that many coconut trees! It was easier in the beginning when there were a lot of trees but was more challenging when there were only two or three trees left! I challenged them to see if they could get an exact number. It was fun! I think my favorite part of the week was when we had Shared Reading and read a poem together. It said, "Chicka chicka boom boom, will there be enough room? Here comes ____ up the coconut tree!". I would have them all close their eyes, choose a plastic letter with magnets on the back, and place it on the blank spot in the poem. Then, they would open their eyes, yell out the letter, and we would read the poem together again. I used five letters each day, with six letters on the last day. It was a great review for all of them, and they loved seeing which letter it was going to be! This is a great activity for a small group I had a great time! Chicka Chicka Boom Boom is a wonderful book to use in all types of classrooms. The letter review it provides is helpful, especially in those first couple weeks of school, when everyone is getting back into the routine of school. It invites the children to say the words along with you and the bright colors of the illustrations grab their attention as the scent of coconut fills the room! Musical Color Mixing? Weird Science for Sure! 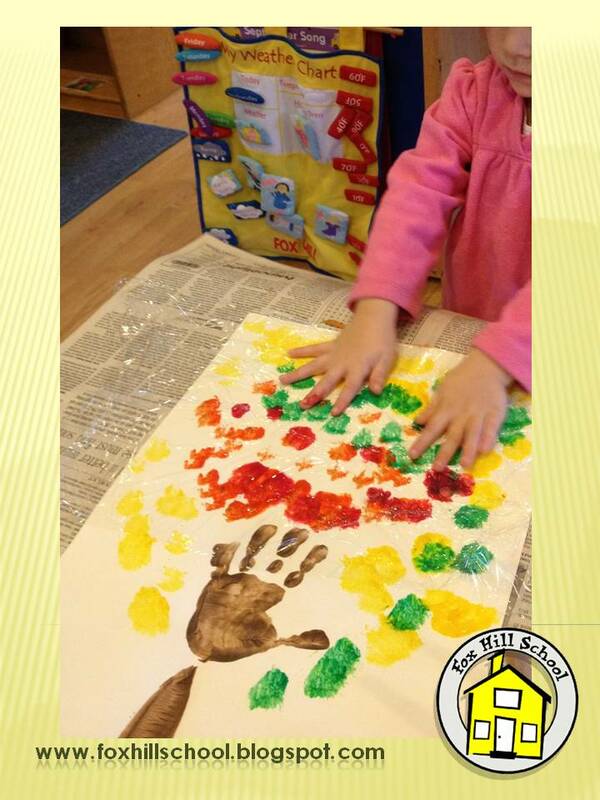 As part of our LMNO Peas curriculum unit, we learned all about colors! The peas in the story are artists and scientists. We figured if the peas can do it, so can we! We made a colorful xylophone and learned about colors, measurement and music! First, the kids use measuring cups to fill glass bottles with increasing amounts of water. Then they use eye droppers to drop food coloring or liquid watercolors into the bottles. 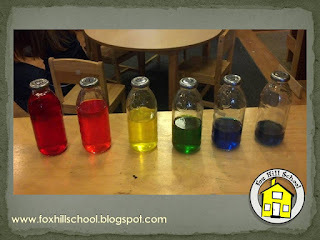 They learn that they the can make secondary colors by combining primary colors. 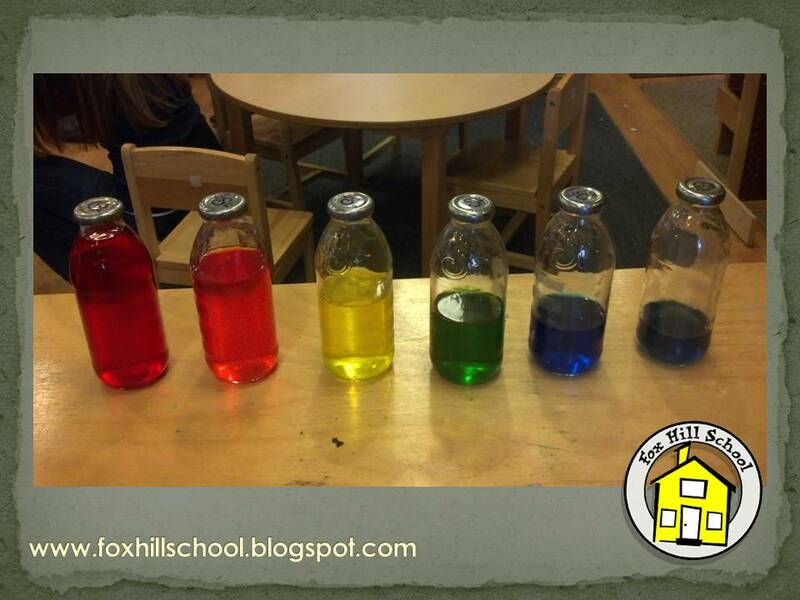 Once they have created all the colors of the rainbow, we put the lids on the bottles and give the kids a spoon and ask them to tap the bottles and see what happens. This is a good time to ask them why they think the bottles make different noises! Then the xylophone is made available in the classroom for independent exploration. The kids love discussing how they made all the colors for the xylophone while they play a tune for their friends! 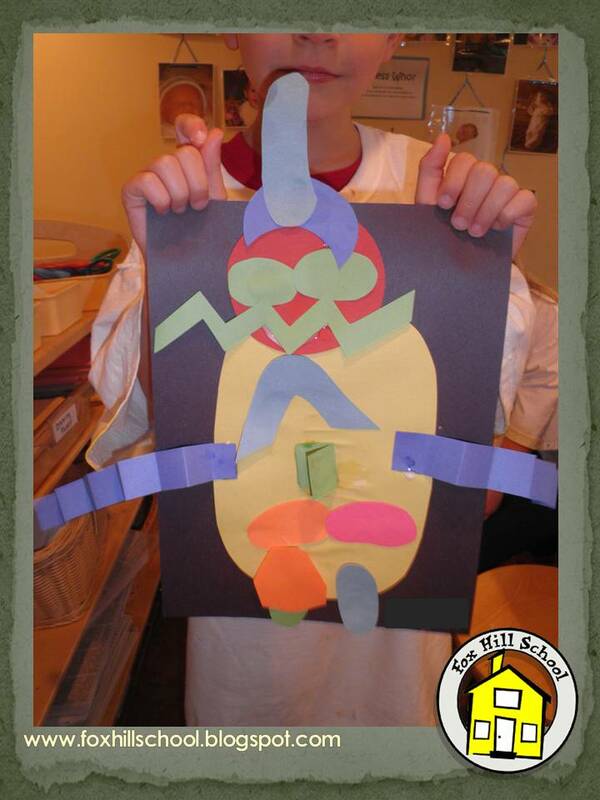 We CAN be artists, scientists and musicians just like the peas! If you would like the directions for this great xylophone project, click here for a free download! We Are Like Peas in a Pod! 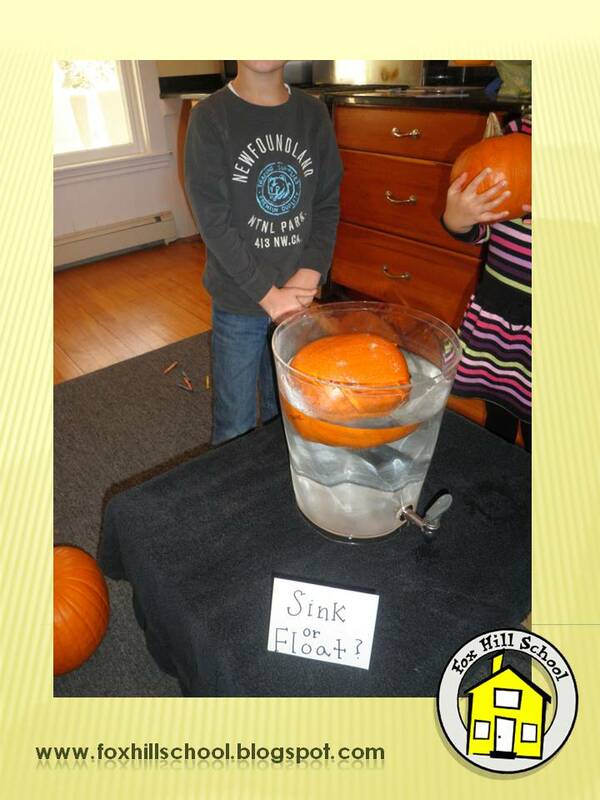 Science is so much fun with this age group! 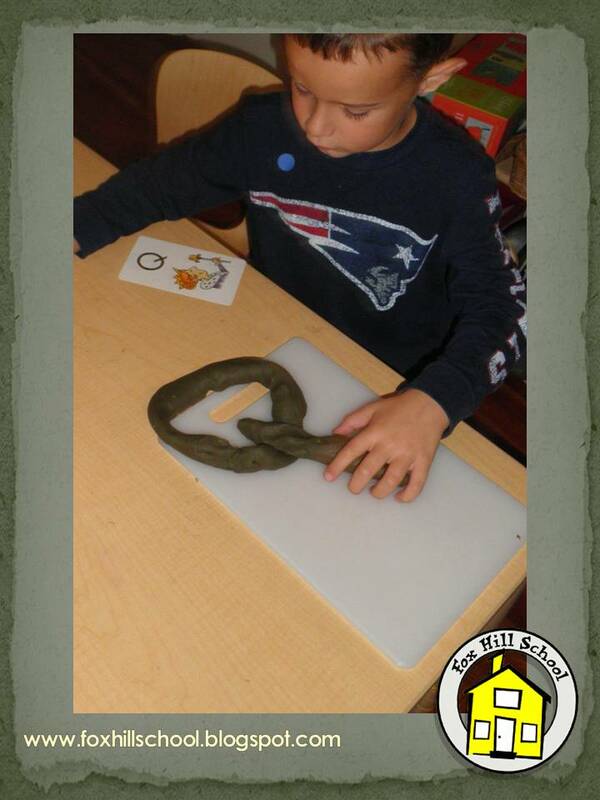 During our time with our focus book LMNO Peas by Keith Baker we had a blast with all of our scientific exploration! One of my favorite group times so far this year was the day we hypothesized about pea pods. First we graphed how many children thought all pea pods held the same number of peas inside. Next we asked how many peas do you think are inside? Will they be small or large? We wondered, debated and stretched our imaginations as to why all pea pods don’t have 3 peas or 5 peas inside. Lastly, many of the children popped their peas into their mouth! One boy didn’t even bother to look at how many peas were in his pod…..he ate the entire pod!!! It was amazing to see several children who typically pass on all but the starch offerings at snack taste the peas and discover they enjoyed them! So much science: 5 senses, hypothesizing, observing, and documenting!!!! All from some tiny peas!